I have often mentioned the Biltmore House in my writings. I love the civility with which dining and entertaining has been governed throughout the home’s history. Every time I tour the estate and gardens, I am inspired by the wonderful colors and textures. I can’t imagine being a new bride and rounding the corner to find that Biltmore was my new home, complete with every possible appointment all planned down to the last detail. It is no surprise that Biltmore for Your Home, a gorgeous line of products, finds its way into homes across the country. The beauty of the carefully selected fabrics and colors is so inspiring. Biltmore for Your Home has captured the elegance of Biltmore in these lovely creations. This charming and beautiful floral is printed on a textured jacquard ground and brings polish and color to your bedroom. The inspiration for this ensemble was based on the many Magnolia species on Biltmore estate, on the original plant lists, and in the earliest nursery catalogs. The most popular species is the Traditional Southern Magnolia that grows on the estate and is admired for its large, fragrant white blossoms and elongated, dark glossy green leaves. A Magnolia tree was planted in honor of the birth of Cornelia, George and Edith’s only child, and was named “Baby Tree.” Find your escape in this garden of beauty and serenity. This lovely salmon-colored floral design with sage accents and meandering leaves will bring brightness to your spring. The ensemble was inspired by a portrait of Mrs. Rathbone Bacon and Virginia Purdy Bacon, a cousin and close friend of Mr. Vanderbilt’s, found in the Oak Sitting Room at Biltmore. The classic bedding ensemble with the slate blue crinkled bed skirt and embroidered decorative pillows will complete your bedroom retreat. This is the first linen collection offered in the Biltmore line. The creams and taupe are accented with a lovely turquoise. Linen fabric is featured in many of the textiles found in the house and is still as popular today as it was in the days of the Vanderbilts. One lucky winner will receive the bedding of choice from the three pictured here. Your gift includes the comforter and two shams in your choice of king or queen size, plus one decorator pillow. Get Southern Lady’s new book! anniversary, we feel blessed he is still here and treasure each day we have. I attended Southern Lady Conventions, and have not been able to visit Biltmore. This would be a perk up to the bedroom and in a way bring Southern Lady & Biltmore to our home and would be a surprise for Mr. Bill. I’ve had the joy of visiting the amazing and timeless Biltmore Estate with my sweet husband to celebrate our anniversary. What a treasure it would be to win the giveaway for the beautiful bedding! The beautiful bedspread would look so nice in our room. I’ve been searching for linens for the master bedroom for some time. It needs a makeover. When I saw these linens I knew they would make our bed a comfy retreat. the colors are perfect as we moved to the eastern shore 2 years ago. We have a queen size oak attic treasures bedroom. Can you spell beautiful. What beautiful bedding! Biltmore is very special – an era that we all dream about. I am headed there in May with my family. I would love to win the bedding. My daughter is getting married in September and I will be re-decorating her bedroom because she is taking her bedspread with her. How special to have one of those pretty new comforters. This giveaway is now closed. Look out for the winner on my Facebook page tomorrow! Best of luck. Beautiful and would look so great in my bedroom. I love anything Biltmore and I really love Biltmore Estate in Ashveille, NC. What inspiration this is to a home. This beautiful bedding would be wonderful to update and refresh my master bedroom. I love the Biltmore and enjoy reading your blog. Best of luck to all who enter. Gorgeous! I would love to win a new bedding set so I can retire the old one I’ve had for over 10 years. I’m fairly sure I would sleep so much better wrapped in beautiful bedding. We have been able to visit the Biltmore twice and both trips were so inspiring. Love, love, love Southern Style!!! So pretty! I’ve never visited the Biltmore but would love to see it. I’ve admired it from a distance in California! i want to win b/c my bedding doesn’t match and is super old. Oh my – these Biltmore sets are so pretty – would be wonderful to have any one of these! Love, love, love the Biltmore and the grace and elegance it embodies. I would love to have one of these beautiful sets in my bedroom. I love the Enchanting set, but would be happy with anyone. A bed dressing fit for a Princess! I’ve always wanted to be a princess……. The Biltmore collection is beautiful and offers a great deal of versatility. It would be a real treat to have such lovely bedding in my home! My husband and I have visited Biltmore on two occasions. We’ve taken the house tour, visited the greenhouse and winery, toured the grounds, dined in the “stables,” purchased gifts from the wonderful shops, and on our most recent visit, we took the Architect Tour. Such a treat to go into some of the nooks and crannies, up on the roof, and even peek into the attic. Such thought went into the design of what was not only a mansion, but also a family home. Our house is not a mansion by any means, but it is home. My mother had a wonderful knack for turning a house into a home. People tell me I inherited that from her. It would be a real pleasure to win a set of this beautiful bedding. I especially like the Enchanting set because that is what so much of the Biltmore history and decor is …enchanting. My family and I visited the Biltmore several years ago. The elegance and beauty of that place is a treasure in the beautiful setting of Ashville area. I purchased a gift book of the beautiful mansion and have it on display in my home here in San Antonio. These beautiful linens from ” Biltmore for Your Home” are beautiful and certainly do bring back the nostalgia of our visit there. I especially love the “Enchanting” set. Would love to win such beauty for my home……after all you cannot have too much, ” Biltmore for Your Home! “! Having always had multiple dogs in our family, I am now at a time I can truly enjoy having extravagant bedding! I would be so delighted to have any of the Biltmore bedding selections. Thank you so very much for the possibility! Enjoyed my visit to Biltmore years ago. I’m in to mood to redecorate my bedroom and think that Virginia would be the perfect ensemble to make the room perfect. Thanks for a chance to win this great giveaway. Love reading “The Ribbon in my Journal”. I went to the Biltmore House at Christmas with my father a long time ago. What a sweet memory of him and the Biltmore. The Biltmore House is gorgeous! I would love to win the bedding. It is beautiful. Thank you for the opportunity. Would love anything from Biltmore….it is just beautiful!!!! My mom and I just returned from a visit to the Biltmore Estate. What a lovely experience! The house and grounds are just breathtaking and full of amazing details. I would love to win the gorgeous bedding – a reminder of the beautiful Biltmore and a wonderful trip with my mom! A – and I really want it badly! I just love the refreshingly romantic feel of the Enchanting bedroom set! I’ve been living in north Idaho with my daughter in her home for several years, she left and went back to So Cal and I have been staying in her home with all her colors and furniture. She has an eye for decorating on a budget, but it just isn’t my cup of tea! Last winter she came and moved the last of her things so the home is mine! I’m painting every room and redecorating so I will finally after 9 years feel AT HOME! There is so much more to this story but my time is limited, you know that we all have to go to work to support our decorating budgets! Thanks for introducing me to the Biltmore and offering a giveaway to get us all excited! Of course I have pinned the Enchanted collection on my Pinterest board Home improvement! Biltmore is still on my bucket list of places to visit. It would be a challenge to pick a favorite of the three choices! Thank you for giving one person the opportunity to eventually do so. I like so many that have already posted would love to bring some femininity and history into my home. I understand that seeing the Biltmore mansion is as close in America as seeing Highclere Castle in Great Britain. Both of these are on my bucket list. Having one of these bedding sets would be a catalyst for my re-decorating plans. I shared on Facebook to inspire others. LOL! Lisa, I hadn’t read your post when I wrote mine…I wonder how many other things we have in common on our “bucket list” ?? I even looking for bedroom linens for my guest room for months! I cannot find anything I like. These are gorgeous! Thank you for the opportunity to enter this wonderful giveaway! The bedding sets are beautiful and each one would look absolutely perfect in my home! I love reading The Ribbon In My Journal posts. I look forward to receiving them in my in box and I have saved each one so that I can go back whenever I want and enjoy them! It is always so special to own a piece of history. Having the Biltmore bedding would be an honor. All three are beautiful; Sanctuary is my favorite. Love it hope I win! I would never splurge enough to get anything as lovely as this bedding. Sanctuary is a lovely design. I would love to win this beautiful bedding. What a joy it would be to redo a bedroom. To sleep like royalty would be so nice. Any of these Biltmore bedding sets would refresh my bedroom for Spring. I would love to win the Enchanting set. It looks like it would be so relaxing and nice to settle into after a day of teaching high school students…. I’m not sure when this give away expires so I’m going to give it a shot. What beautiful bedding! We haven’t purchased any in years…bedding it hasn’t been a priority, I guess. Tweeted about it! Thanks for the chance. Love them all! Especially Enchanting & Sanctuary! Shared on facebook. I would love to win a comforter set. I am from the south, Charleston SC. As a summer job in my youth babysat for very wealthy people in Ashville. It was very hard but always thought I would return to see Biltmore ! Thank you! The Enchanting bed would be an elegant addition to my bedroom. My husband and I are hopefully replacing our 15 year old mattresses and the Sanctuary set would look amazing on our new bed! I live within about an hour of Biltmore House and frequent it fairly often. It’s a lovely place to take out of town visitors. I would delight in this wonderful bedding set. Everything from the Biltmore House line brings that little touch of elegance! It would be heavenly to sleep in such elegant bedding. Good luck to me! The last two years have been so difficult for me. Many losses and. Now I am ill, just on the way to recovery. The “sanctuary” that these bedding would surround me with would indeed be a very welcome pleasure. They are just beautiful. Good luck to all and thank you. I can see my special family and loving friends walking into our guest bedroom greeted by the elegance of linens from the Biltmore Estate. When we visited the Biltmore we were overwhelmed with the grandeur of the home and the grounds. Winning a bedset like this would be such joy! Thank you. I have always dreamed of visiting Biltmore since my grandparents’ visit years ago when they brought back a book about the estate. I would love to dress up our master bedroom in linens inspired by such an elegant setting! It would be so amazing to have such beautiful bedding It’s been many years since I’ve had new bedding and never anything this beautiful or luxurious. It would make a lady feel like royalty. I could certainly have sweet dreams in this bedding! I’d love to win it and prove it! We’re getting ready to paint our master bedroom and need new bedding! I love magnolias and so the “Enchanting” ensemble would be perfect for my bedroom. So feminine and pretty. Makes me smile when I look at it. Who wouldn’t be delighted to have one (or all) of these luxurious linen sets in their home? Texas born and raised with heavy Louisiana influences from my grandmother, I’d be tickled pink to have a set of these on my bed. I’d love to win because I just moved into my first apartment and would love a beautiful comforter for my bedroom! This is a beautiful giveaway. I would love to redo my bedroom in style. You always show us such gracious living styles. Love this bedding. Just painted my room and a few of these would actually match!!! Even though I live just about four hours from Asheville and have been there a few times, business and scheduling prevented me from seeing Biltmore. I see commercials on our televisions for Biltmore and they take me back to a kinder, gentler time. They make me dream of wonderful things: foods, flora and fauna, decor and fine linens and towels……………..all things we never had when I was growing up. It was a way of life I could only dream about. And dream I did. This bedding set would be wonderful if I should be the lucky winner. It would be treasured. “Enchanting” is aptly named…so restful for a bedroom retreat. Bedding like this is what dreams are made of. My husband surprised me on Valentine’s Day about 15 years ago with a bedroom set. In 31 years of marriage I have never been able to afford a set of bedding to dress my bed. What a delight it would be to treasure something like this! Thank you for this opportunity. Gorgeous bedding! I love the Biltmore Estate and the Biltmore collection for its beauty. I would love to have this bedding in my own home. I never have or get nice things. To fall a sleep and wake up to beauty and comfort wil be just wonderful. So very gorgeous! I would love to win this to give to my Mother as a gift. The Enchanting set are her favorite colors so she would be absolutely thrilled! Thank you so much for the chance! Hi, I would love to win The Enchanting bedding set, when I fist saw it in my email page it brought a smile to my face, I have a passion flor flowers and love the pastels colors in it, perfect for Spring-Summer time, I been wanting to buy a new se t for our master bedroom but we had other priorities. Thank you for the opportunity. I am new to this brand, but it looks beautiful! I have such a hard time finding something of quality in my style. It was such a surprise to be scrolling through and find this! Hope I win!!! I just love the Enchanting bedding set – it truly lives up to its name! I would love to win this set and freshen up our bedroom; the pops of pink against the blue make it so romantic. Thanks for the opportunity! I would like to enter the contest. The Magnolia Set is so beautiful, so southern. I have always liked magnolia flowers because they are so beautiful. Thank you, Phyllis, for the opportunity to win in this great giveaway. I really like the Enchanted magnolia set with it’s cripsy white background, sure to brighten a room. the magnolias were so beautiful, but extremely fragrant for her little house. I live in the south and there is no tree more southern than the magnolia. It would be a perfect design for my Edwardian style bedroom set. I love flowers and lots of fru-fru. Beautiful linen like this can transform more than a room. It can sooth the senses of sight and touch and bring luxury to a humble room. All I can say is “Beautiful”. All three of these sets are beautiful and either of them would be a delight to own. What a beautiful and elegant bedding set Virginia would be in my own first home after raising six children and am now divorced and alone. It reminds me of beautiful crewel work which I so much admire. It would make my bedroom a room of great comfort and beauty. Thank you for this wonderful opportunity. Your magazines and journal give me great joy and I thank you very much for that and this wonderful give-away. It would be such a pleasure to win. Thank you so very much. It would be a dream come true to win the stunningly beautiful bedding. It will be the centerpiece of my master bedroom around which all other de rating decisions will be made. I would love to have this lovely bedding in my room. It reminds me of the beautiful trees in Alabama where I lived for a year many years ago. All of their bedding sets are absolutely beautiful. What a pleasure it would be to “make your bed” every day with any one of these sets. Visited The Biltmore several years ago and LOVED it! Didn’t realize they had a product line- All three of the patterns are gorgeous but the turquoise and beige totally speaks to me! Would give me the incentive to replace my red/gold bedding which I know is dating it’s purchase! I love the Biltmore House and Gardens. We have annual passes and go as often as we can. I have a complete bed set. It is made in China and is cheap. The tassels have fallen off to the point they are almost gone. The stiches in tne quilting on the comforter has pulled and puckers to the point I wont even put it on the bed anymore. I won’t ever purchase any other product. I adore the Biltmore! I have the Biltmore tea dishes which would be perfect on my breakfast tray resting on these scrumptious linens. Ahhhhhhhhhhhhh hope to be a fortunate winner!! Thank you ever so much for the opportunity. Absolutely beautiful . I would love to win the beautiful bedding. I would never be able to afford things like this but I would be so amazed to have it in my home. it would so give me a sanctuary to escape in. thanks for the opportunity to win something like this. This is a very gracious giveaway. I love the collection and learning a out the story behind the design. I have always wanted to visit the Biltmore, and winning this would be like bringing a little of it home. Years ago my husband and I, along with our dear friend who lives in NC, spent a wonderful day at the Biltmore Estate. We spent an entire day exploring the amazing elegant chateau, gardens and a delicious lunch. I purchased a lovely plate in blue and white with a drawing of the mansion done by Blue Delft of Holland. It is displayed very proudly in my dining room hutch, a precious reminder of our amazing visit. How blessed I would feel to have a bed covered in Biltmore linens. Thank you so much for the opportunity to win such an amazing gift. Was there with my best forever friend. I brought home a piece China but would love to finish off my bedroom with a touch of me bury and elegance. The Biltmore is such a beautiful, grand place. Just walking the grounds lends oneself to dream. Thank you for offering a chance to win a comforter set. Thank you so much for the beautiful offer. I love love love the Biltmore and enjoy each article your magazines have featured, particularly at Christmas. All three patterns are beautiful, but I like Enchanted the best. I am contemplating a move to the South and love the Asheville area — primarily because of the proximity to Biltmore! The home is magnificent and the gardens offer almost endless beauty. I would love to have a small part of my home reflect the elegance of Biltmore. Nothing is as welcoming to either a guest or your self as an inviting bed… I would love my bed to welcome nightly! Just beautiful! I am an Architecture student and I immediately fell in love with the Biltmore house, landscape and gardens the second I entered the estate. I love how regal the Biltmore line is and how the designs mimic colors and patterns of the estate. Absolutely in love! Beautiful, elegant fabric on bedding. Beautiful collection! It would be difficult to choose a favorite! Thanks again Phyllis for introducing me to another line I was unfamiliar with! I love everything Biltmore, have been visiting the house since third grade and would love a bed set! Love it All! And I especially love your blog! Lovely bedding, would look wonderful in my ‘new to me’ home. I love the detail in the fabric and it would make my bedroom seem like a luxury and peaceful sleeping sounds so good. It would be so nice to have something new! Please see “the ribbon in my journal” about the Biltmore! very interesting! 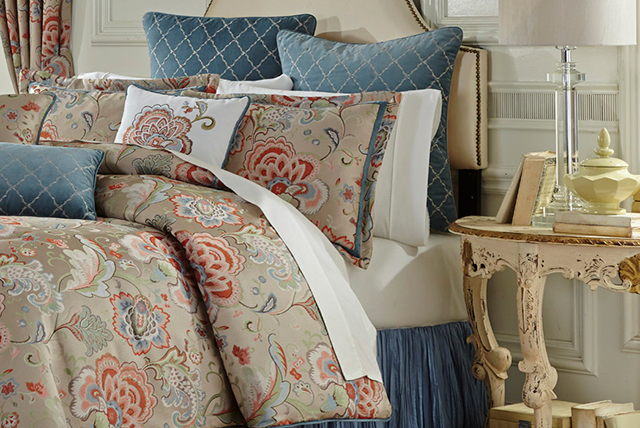 I would love to win one of these beautiful comforter sets. Our bedroom is painted the exact color to coordinate with any of the colors shown here, and my current comforter is truly worn out. I have been looking for a timeless style and I have finally found it! Thank you for your post about the Biltmore, you have enriched my life! What a difference a well-made bed makes! What taste, what colors, what STYLE. One more addition to my bucket list. The bedroom collections are just lovely! Thank you for offering such a beautiful prize, Phyllis! I love the Biltmore Estates! I am leaving next week to see the house and gardens in Springtime and view the Downton Abbey costume exhibit. The bedding is absolutely gorgeous and I would love to win! Thanks for this offer! These are all gorgeous! I’d have a hard time choosing, but what a time it would be! Virginia would make my bedroom feel like sleeping at the Biltmore House! I would to win so I could give it to my mom for Mother’s Day. She’s so special to me. She put her life aside in order to adopt me and give me the life I’d never have without her. I would love to give her something that’s as special and unique as she is! The Magnolia spread makes you feel like you stepped back in time. I love everything in the Biltmore collection. I would love a new bed ensemble. Thanks for the chance! Would love to win! Just bought a new bed…first one in 30 years and need bed clothes for it…this is so awesome and peaceful! What a lovely gift for one lucky winner! I hope its me. I think this gorgeous bedding would really lift my spirits. I have not redecorated my bedroom in many years. Thank you for the chance to win this generous giveaway! I love the Biltmore collections it would be almost impossible to pick a favorite item, but I could if I won. I would love to have the lovely Biltmore bedding! I have admired all things Biltmore for a long time. My husband grew up in Asheville which would make owning the bedding even special. Thank you for the opportunity to enter. I have not had new bedding since 2002. Could really use it. Also would like something new since I have started a new stage in my life being a widow and having to move to a new residence. Looking for things to make me feel beautiful. That is what this bedding would do, make me feel good in bed. Would love to win this beautiful bedding. A lovely reminder of our visit to the Biltmore. I would love to win this beautiful bedding! I have really been wanting to redecorate our master bedroom and this would a wonderful start! I would love to win such a beautiful reminder of our visit to Biltmore House. Shared on Facebook, looks absolutely lovely, so refreshing! How beautiful! I would love to win! We just moved into a new house. I would love new bedding! Thank you for this opportunity. Would love to my sister if I win. I have purchased Biltmore Bedding for a couple of years. The detail in their work is really quite something at an affordable price, ( it is easy to switch out.) I love the new Linen. For the last month or so I’ve had this feeling come over me when I go to bed: This room needs a LIFT! I believe this would be my jumping off point. Thanks for a chance to win beautiful bedding. At the young age of 53, I am moving to start a new chapter in my life. Any one of these linen sets would be welcome. They are all so beautiful! Thank you for sharing. The Biltmore House is a place I would love to visit. The bedding is beautiful! Thank you for sharing with us, what fun it would be to enjoy one of these at home. I pinned this on Pinterest. Not sure when it ends, so I hope I’m not too late. I love the Enchanting ensemble. Beautiful! I would love to win this because like Spring, it will renew my spirits! Not to mention really dress up my bedroom! Have remodeled the master bedroom and would love new bedding from BILTMORE at Home. Retired, had to downsize and on a fixed income. Very hard adjustment and would love to decorate my bedroom and make it beautiful with new bedding. I love the beautiful waxy blossoms of magnolias. Enchanting is enchanted…the Southern Magnolias are as beautiful on the bedding as in the gardens at the Biltmore House. My late husband planted a Magnolia tree for me soon after our visit to the Biltmore Estate because I feel in love with the trees. They remind me of that wonderful trip every time I look in my tree. Enchanting would remind me it also. Thank you for bringing us this beautiful collection. The bedding is so beautiful! It could transform a bedroom into a retreat that would bring tranquility into my home. I think all of the choices shown are so special. But I think I like Enchanted the best. Hopefully, I’ll win!! I recently saw an ad for Biltmore products. 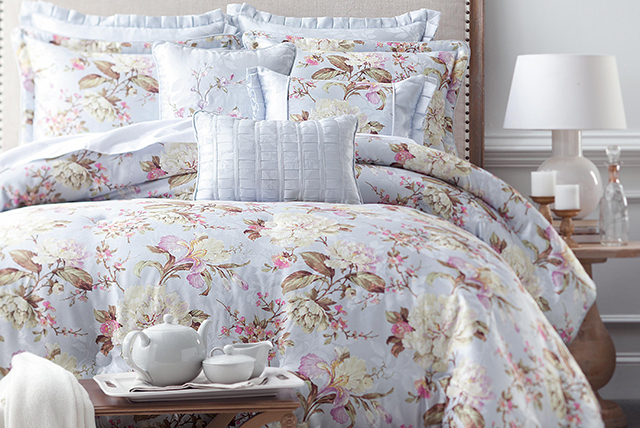 The enchanting bedding set reminds me of sunny days. Would use this set in my guest bedroom. My husband dislikes what is on the bed now. I am planning on changing my room around and wanted new bedding and paint for my room!! Can’t afford both so I hope I can win!! I have the very first issue of Victoria and every issue since. Your magazine has gotten me through some very difficult times, including two weeks in Russia when we were adopting my daughter (then three years old). I have always adored Victoria! In fact, it’s my daughter’s middle name. I would love to win the “Enchanted” bedding. It is exquisite. I will be in South Carolina this summer and hope to see the Biltmore. It’s a lifelong dream. Ethan’s for the chance to win. Actually will be going to the Biltmore house on Sunday. It is beautiful there. Oh! How utterly divine it would be to have to choose among the three Biltmore bedroom linen collections. Nothing is quite as sumptuous as having an evening bath or shower and then slipping into a luxurious bed. Spoil me, please. Thank you for this great and generous giveaway. Thank you or sharing these beautiful bed linens. Enchanting is my favorite, love those magnolias! What a lovely giveaway. The bedding is beautiful. I would love to make my bedroom look as inviting and relaxing as this Southern Style Biltmore set! The beauty of these sets makes me dream of enjoying a beautiful bedroom. All of these are beautiful, but I really love the blue. Gorgeous bedding! I haven’t bought any bedding for my bedroom,…since 205 I just never really see anything that grabs me.I am repainting and flooring the room now,This would make a beautiful transition to my bedroom,my Sanctuary. Sanctuary is my favorite,It has a Beach look to it! I love the Biltmore as well. I adore the Sanctuary pattern. It would be so perfect in our bedroom. It would be delightful to win something. Wooohoooo. I love all three linen sets but I love Enchanting ! Thank you for the opportunity to get a bit of the Biltmore in my home ! I could only imagine…these are beautiful, rich and elegant! What lovely linens! Anyone would feel like royalty with a bedroom furnished with them. want all to see that visit my boards. Because my bedroom hasn’t been redecorated since we moved in over 20 years ago, we are finally getting to it now and the colors of Enchanting would be perfect! Love the bedding gorgeous! Love to win it! I love Biltmore!! Can’t wait to visit again. And the bedding simply beautiful. Have always wanted to visit the Biltmore Estate. This beautiful bedding would be like the next best thing. “Enchanting”! What lovely pattern for a lady’s boudoir or in my guest bedroom. Oh my! the Virginia would look so lovely in my bedroom. I would so enjoy this beautiful set for sprint. I love Biltmore, it is one of my favorite place to visit. I could go every season every year and never tire of it. Spring is a new beginning time and this bedding is just sheer joy to my heart! We have 3 children who have been playing on our bed for several years, and our current torn comforter is showing its age. The kids are big enough that the wrestling matches have mostly subsided, so a new comforter would be enjoyed by all. I tweeted! Sanctuary is beautiful and would be my choice! These are beautiful! Would love to win to have a nice makeover for our bedroom. They are all beautiful, but my choice would be Sanctuary as it so describes what our homes and bedrooms should be. As a full time: nursing student, CNA, mother, homeschooler…. I could really use an update in my life! What a beautiful way to update a bedroom! I would love to win the Enchanting in a king size as we are moving back to Minnesota to be by our family. This bedding would be a beautiful, fresh new look for a new chapter in our lives. Lovely memories of the Biltmore Estate and Gardens as well as our stay at the beautiful Inn At Biltmore for out 25th anniversary come swirling into my mind at the sight of this gorgeous bedding! What beautiful bedding! Would love to have this in my home to create a more peaceful setting in which to dream the night away!! Absolutely beautiful bedding – thank you for sharing. Our dream is to visit the Biltmore someday. What genteel patterns! I would feel like Mrs. Vanderbilt herself if I won one of these ladylike bedding sets. What a wonderful giveaway! Would love to win as a remembrance both of the time we visited Biltmore and my favorite magazine! Beautiful patterns! I would LOVE to have one of these lovely sets. I am long overdue for new bedding! I would love to win because I really need new bedding. Having been through a divorce, loosing a son,taking care of my daughter and grand daughter and a period of unemployment everything I have is old and worn out! At 62 I am now working again and trying to rebuild my life and do some things for me for a change which is something I have never done, I have done without to give to my family. After getting repairs done on my car I plan to start on my house. Winning would be a blessing. Thank you for the chance. I love touring Biltmore and the incredible gardens. I am so hoping to make it there to see the Downton Abby costumes. The next time I do Go there I will pay special attention to the linens. One more reason I love living in South Carolina – Biltmore is drivable. Thanks for letting me enter this contest!! I am 65 and I’ve never had a comforter that fits my king size bed. I have been to the Biltmore and I was completely enchanted, something like this would be wonderful! Rene, I too, as so many people, lovingly have taken care of a family memeber. It was both wonderful to have my mom with us…. To hopefully brighten her day….. But also so hard to see her in pain! I hope you win the new bed linens as it may be your place of comfort. Whe you leave that cocoon you can put the very special and necessary smile on your face. Love and prayers for your strength. I love linen and turquoise is my favorite color, so Sanctuary is my choice. Beautiful! Love the taupe, creams and turquoise. What a sanctuary! I just happen to be looking for new bedding in my master bedroom. I think Enchanting would be perfect! 🙂 I’ve never toured the Biltmore, but to go at Christmas is a dream of mine! Thank you for an opportunity to win a beautiful comforter set! All of the bedding ensembles are just lovely. I often rationalize that I will never live in the Biltmore….but I could decorate my humble home with beauty ~ just the same. Wish all your responders could win the bedding of their choice. But me first! The Biltmore bedding is so beautiful! I would love to have Enchanting to update my master bedroom. I have visited Biltmore House and stayed at the Inn on the property many times and each time is still as enchanting as the last! I would love to have one of these sets of beautiful bed linens for my home. The Enchanted pattern would look handsome in our son’s former bedroom. We haven’t seen him in over a year, but he’s coming home in June for an extended visit. We can’t wait, how gorgeous to have this bedding waiting on him -:-)- thank you! I absolutely LOVE the Virginia collection, and not just because I live in Virginia. I haven’t had a new bedding set for over 10 years and would love to win this set. It would look beautiful in my bedroom and add a such an elegant touch. Enchanted. It looks chosen for me. It is dreamy. The Biltmore is one of my favorite places. My last trip was with my grandmother before she died. It would always remind me of her. The first photo showing the traditional floral pattern is really indicative of the pages of ‘Victoria’, to me. It is MY favorite, too! As our 50th wedding anniversary approaches, I would love to redo our bedroom, and this beautiful line of bedding would elevate it above anything we could afford to do. My husband has had mini-strokes. This would be a wonderful pick-me-up for me to experience when I have to have a little me time. I would love to win the beautiful bedding. My master bedroom has very old bedding and I haven’t been able to purchase anything new since I have been paying for colleges for the last 8 years!! I am not sure I would want to get our of bed with these beautiful luxury comforters. I would love to have a featured set of bedding. My husband and I are currently working on redecorating our bedroom after 20 long years. We have my mother who has been in our care for over two years. We have been blessed to care for her through cancer. She is our miracle, now living almost two years after we were told she was dismissed to hospice with three weeks to live. She brings our families so much joy. The remodeling of our bedroom is for inspiration and encouragement to us through stressful, but joyful times. It would be a JOY to hear we have been picked. Thank you. I love all the media Hoffman publishes. I look forward to recieving your blog. It’s always refreshing. Although I have yet to visit the Biltmore Estate (it’s on my list! ), I imagine it to be our American version of Highclere Castle – – the “real” Downton Abbey (which I have visited!)! Winning the “Virginia” bedding ensemble would certainly inspire my dreams of visiting the Biltmore House one day soon. I’m already dreaming of “Spring at Biltmore” . . . . dreams really do come true, don’t they?? I would love to have one of these beautiful bedding sets to refresh my master bedroom and create a peaceful sanctuary. I love beautiful bedding! I have a very old “quilt” on it now but it must be put away, out just for show at the bottom of the bed so I will be needing new bedding. These are beautiful! I love all your posts and look forward to them daily. Thank you so much! since I have been recently widowed. Thank you. These are so gorgeous! I’m a teacher and so we’ve never had the money to splurge on such beautiful bedding. I would love something like this in our home! We just moved into a new home with beige walls, and I have lots of beige in my bedroom already, so it would be nice to have a comforter set in a nice pattern! Everyone Blessed to have visited or inspired by photos and writings of the Biltmore estates and products, would love to win! May the best man win! Thank you. Phyllis, you certainly know us well! You continue to remember, find and offer things that pull our heart strings. I’ll keep my fingers and toes crossed that I will be lucky enough to grace my new coast home master with one of these beautiful ensembles! Love the bedding and I think my favorite is Enchanting. Touring the Biltmore is on our bucket list. I love the Enchanting. It’s on my list to tour. Pick a favorite? Each is more beautiful than the last. It creates a never ending loop! A stunning collection! The Biltmore bedding is gorgeous and I need King size bedding to redecorate my master bedroom. I would love to redecorate our master bedroom, now that we are empty nesters. I have never been to Biltmore but always enjoy the articles about it in Victoria magazine…especially the Christmas trees. The bedding is truly lovely…you wouldn’t need any artwork on the walls…the bedding would be the art in the room. Absolutely beautiful and elegant. My husband and I visited Biltmore several years ago, and are still making plans to return soon. Oh, please let me drift off to sleep and awake refreshed in this lovely field of flowers — the ENCHANTING pattern lives up to its name! I absolutely LOVE the Biltmore and am planning a visit in just a couple weeks as my daughter and I travel cross country back home to California from her university in Virginia! 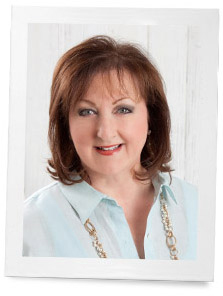 I would love to be added to your giveaway-I’m such a fan of Victoria Bliss and Cottage Home! Truly the Enchanting design was named with the proper name! It is enchantingly refreshing! I’d love to win the Magnolia spread, absolutely gorgeous. I love Enchanting! Oh when I see Magnolias I know I am home! The south where my heart belongs. I have been gone for a long time and now I am home again! How beautiful this would be in my bedroom! Can’t you just smell them lining the walk as you come home to mama cooking? Sweet memories!! Blessings and thank you ever so kindly for the post and the give a way!!! I do so thrive on the beauty both in vision and word! What a lovely giveaway. I would have to chose Enchanting as it is so classic and southern. I have a magnolia tree outside our front door. Biltmore would be a dream place to live. Dear Phyllis, what a beautiful collection! Our first trip to the Biltmore was 40 years ago and we still reminisce about our time there! Enchanting! I’d love to win the bedding collection because we are building our retirement dream home and are furnishing a new guest bedroom, along with refreshing our own bedroom…so lots to purchase! It would be lovely to do our bedroom in Virginia! Thank you for the opportunity! My husband and I visited the Biltmore on our 25th anniversary (soon to celebrate 53rd) and I have always said I would loved to have lived back in the day and been invited to bring my trunks and stay for a month. Everything was beautiful as is the Biltmore line of bedding. My choice is Virginia. Thanks for a great giveaway. such beautiful sets, they make me think of floating in a field of flowers, lovely…I would be thrilled to win one of these…. Thank you for sharing the beautiful quilts. Going to bed with fresh new elegant bedding and waking up and still in the moment of beauty would be a dream. I’m moving to the city in two months. I’ve been in extreme rural montana for 15 years. It’s time to enjoy elegance at its finest….would be a dream I’ve had for 15 years waking up in beautiful bedding in the city. What wonderful bedding! Enchanting is exceptionally beautiful. Why would I want to win? Well, these are very beautiful bedding sets and I have been wanting to redo my bedroom for a long time. A beautiful Biltmore linens guest room! A perfect picture! Biltmore and these beautiful bedding selections are a representation of generations of classic Southern Beauty and Charm. 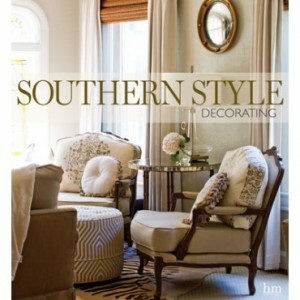 Any Southern Lady would LOVE to add one of these collections to her home and I am definitely one of those ladies. What beautiful bedding… so difficult choosing a favorite. 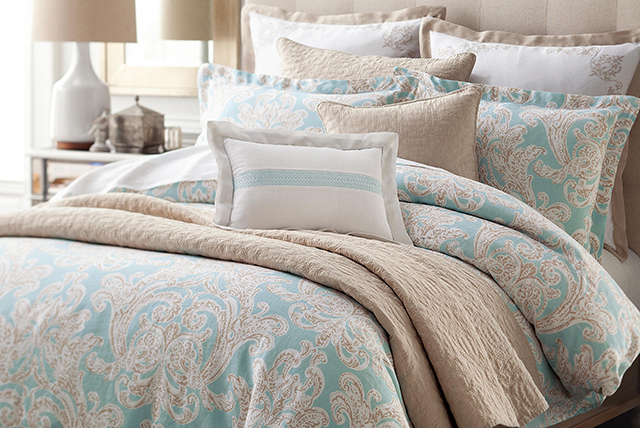 The beautiful bedding just makes you want to snuggle in and never leave your bed. I am getting ready to refresh my bedroom and Enchanting would be a terrific choice! I have not been to Biltmore as yet but having the linens would be inspiring. Both patterns are beautiful! Would love to win. All of the bedding is beautiful! I would love having it for a new look in my bedroom. Love this exquisite bedding. Since my hurricane loss several years back, I have been trying to replace certain items and make them look fresh. This would be so beautiful.! Biltmore is one of my favorite places! I’d love to win these gorgeous linens. All three are so lovely! I would be thrilled to win a set to use for my bedroom. I absolutely love the Biltmore Estate and loved visiting it a couple of years ago. I would love to win the bedding. Just beautiful ….would love to freshen my bedroom with a new set of bedding! Please don’t ever stop having Victoria magazine or The Cottage journal, they are both a bit of joy in a sometime weary world..
Each bedding is extremely beautiful. I would so love to be able to present one to my daughter who is getting married in December 2015. We visited the biltmore when she was 5 years old. It has always been one of our most talked about trips as she enjoyed the “big house” as she referred to it then , as we did. Thank you for sharing these lovely gifts. Just repainted our bathroom & would love to add this to the room!! Would make a great gift for my daughter as well!!! What an enhancement any one of these beautiful sets would make to a home. Wow! Simply beautiful!!! Makes me long for the South from this mid-west home! Thank you for sharing the beauty and graciousness found in the Biltmore and the South and your magazines! Beautiful, beautiful bedding. Would love to have it in my home and so uplifting for Spring. Thank you for the giveaway. I hope it extends to Canada!! Thank you for the opportunity to win this beautiful bedding. Would just love it for a guest room in my home! We visited the Estates several years ago. So lovely. I would cherish any of these patterns for my bedroom. I love the Enchanting bedding set! It would look lovely on my new 4-poster bed!!! Thank you for your blog and this giveaway opportunity. I would love to have the beautiful bedding. The Biltmore estate is a wonderful place to visit. Love the gardens and the home. Oh, I love the cot, design, and linen fabric of Sanctuary. I would love to surprise somebody special in my life with this set, and I just might have to do that, win or not. Most of all, I love the positive effect that The Ribbon in My Journal, as well as all the Hoffman Media publications had on my life and my home. I love Enchanting and Sanctuary, but could never afford them. Would LOVE to have such luxurious bedding! Thank you. I was on your site today hoping to find some inspiration for decorating our “newest home”. Yes it sounds much more glamour than it really is. You see last August we dropped off our youngest son at college, two days later our moving van showed up to move us from Cleveland, Ohio to Chicago . We downsized and I spent the next four months trying to fit us in as well as make it feel homey. January 2nd we were transferred again. So not glamorous, I now live In Minnesota, beautiful as it is I have moved 15 times in 31 years and I so need inspirational decorating help. I have hit a brick wall. I just love The Biltmore and have visited it a couple of times, what an amazing day of eye candy. so I would also like to be entered into the bedding contest. They are all stunning and any of them would be loved in our new home. Have a wonderful day ladies! A most beautiful collection. I could never afford one but I love to dream . I think I would choose the ” Enchanted ” ensemble. I raised two wonderful boys but I think the flowery one suits me. I’m from upstate New York,Buffalo as a matter of fact. It seems so summery and sweet. Just love it. I am from viriginia and my room is blue so my choice is virigina. But any one of them would be wonderful to have. I have had the pleasure of seeing the Biltmore house and words cannot explain it. You have to see this wonderful and beautiful house to beleive it with your own eyes! Simply stunning. Your taste is impeccable. Thank you for the giveaway. How perfectly lovely! It’s wonderful to see gracious living is still admired and treasured. A little piece of Biltmore of our own. I shall keep my fingers crossed! Thank you for offering such a lovely gift to your readers. Thank you for the chance to win a beautiful bedding collection. We visited Biltmore last Christmas and it was a wonderful trip and such a historic home to tour. Enchanting is my favorite. Thanks for all your wonderful publications. I shared on Pinterest. I would enjoy a new look for my bed. They are all beautiful, but I would choose Virginia if I were to win. Spring fever has hit and I am ready for a Master Bedroom re-do. Love the “Virginia” Biltmore collection. Thank you! Imagine walking into the guest suite to see Enchanting as the highlight of the room! The traditional tree of the south, the magnolia, with the sweet fragrance of the blossoms wafting through the air and the velvety backed leaves spread across my grandmother’s one hundred year old bed from rural Indiana. She would never have imagined how beautiful it would have looked in such luxurious linens! Virginia is my choice! I just painted my Master bedroom an orange that compliments the orange in the print. Love your blog! Oh Phyllis….everytime you post a giveway I think “ooooh….I hope I win THIS one”. Once again you have outdone yourself with your elegant gifts. The bedding choices are all so beautiful, although “Enchanting” would be my choice as it simply is….enchanting! And to be connected to the Biltmore name just makes it all the more elegant. Good luck to all! Thank you Phyllis! All three are beautiful but Enchanting is my favorite. Thank you for the opportunity to win! I’ve never had the opportunity to visit the Biltmore Estate, but always love the pictures I see of the historic home with its beautiful furnishings. Enchanting would be a lovely addition to any bedroom. Love all of these! Enchanted would be my first choice, filled bySanctuary. Sanctuary is just lovely-I’m thinking of redecorating my bedroom and these colors would be absolutely gorgeous. I love sleeping among the flowers! Enchanting would look enchanting in my bedroom! Have been a Southern Lady and Celebration subscriber since the magazines started! Love the Biltmore fabrics , especially Enchanting. Your magazine layouts are always gorgeous, the recipes I’ve made have turned out wonderfully- I even look forward to see which products you have chosen to advertise knowing they would be something that I’m interested in purchasing. I hope your franchise continues for years to come. I collect the magazines and bring out each season to pour over on lazy afternoons. Thanks for all you do! The Magnolia would bring spring in. Refreshing! Love the Virginia! Would look so pretty in our guest bedroom. I hope I am the lucky winner! Oh my how beautify they all are but my favorite is virginia. Nostalgia carries me back to virginia where my daughters and I have spent many glorious days visiting with my special friend there. She is the epitome of southern graciousness and should I win I would think of her every time I made my bed in addition to the beauty of biltmore and it’s beautiful grounds. Fingers crossed. Every one of these are beautiful! I used to live in Asheville, NC and have visited the Biltmore Estate several times. These really capture the feeling. Thank you for the chance to win. Even my husband has commented that we need new bedding. Love the Sanctuary group! Would love any of these. Enjoy your blog so much. I would love to win the “Enchanting” bedding although all of it is lovely. I just love magnolia trees with their beautiful blossoms. Although I live in the north I do have a tree with gorgeous yellow blossoms and my bedroom overlooks this tree – having the bedding would complete my room. Getting ready the remodel our master bedroom. A huge DIY project from total demo to all new walls, woodwork, windows and ceiling, the works! These linens would be a nice reward for a lot of hard work. So beautiful, Phyllis! You have a knack for finding the most gorgeous things. Thank you for sharing this with us! We are relocating to a new home in Fl & have been looking for new bedding. Our home in FL will still be traditional, not going for the FL/beach look. We also have a collection of Teresa Pennington prints of the Biltmore House in all 4 seasons & the 3 interiors Teresa did for the for Centennial Celebration. This bedding would be a beautiful addition to our new home along with the prints we will continue to use in our home. Good Luck to all! What beautiful bedding! It would be a hard choice but I like Virginia. All of the “Biltmore” Linens are just lovely. I think I like the Enchanting pattern best. Thank you for hosting this contest. I always your articles. I love the Virginia pattern. It would be perfect for our bedroom with the colors we use. I am a southern girl and love Magnolia trees also. So elegant! Any selection would give a sense of welcome and relaxation to a bedroom. Well done! I too love the “Enchanting” bedding pattern as well as the Biltmore. Thank you for this opportunity. Just turned my bedding around to try to get a little more use out of it…..would love to replace it with one of these! They are so beautiful. Biltmore design is one of my favorites. To tour the Biltmore Estate one day is on my list of “to do’s”. I love all of the bedding collections but my favorite is “Enchanting” just because of the sweet story behind it. I love it. The Biltmore beddings are beautiful! I would love to refresh our bedroom with such elegant linens!! We have some towels from the Biltmore at Home Collection, but do not have any of their bedding. We live at the beach, and the colors in both the Virginia and Sanctuary are perfect! And today is my birthday!! We planted a Magnolia tree many years ago in honor of the birth of our first daughter . That was 34 years ago … we have since moved,our dear daughter has grown and married. Sadly , we have never had the good fortune for another Magnolia tree to survive in our yard . How lovely to have “Enchanting” in our bedroom. The Enchanting set is beautiful. Reminds me of a charming Southern garden. Enchanting, what a lovely pattern. After having raised boys, a feminine bedroom would be “Enchanting”. The magnolia flowers are beautiful and would certainly finish off my new bedroom retreat. I just love the Sanctuary pattern! My husband and I are about to celebrate our 22nd wedding anniversary and our bedding is seriously overdue for a romantic update. This would look beautiful in our room which catches the early morning sun! These are all lovely bed linens, however, my favorite is “Enchanting”–the magnolias are lovely flowers, one of my favorite spring flowering trees. The colors in the design would blend with the colors in my bedroom. Love Love the “Sanctuary” collection! Would love to win that one. I love the look of ENCHANTING. what a pleasure to snuggle in between the sheets. Ooooooo….I’m enchanted by “Enchanting”! So beautiful…it would make me feel soooo beautiful each morning to wake up in such lovely bedding! THIS one? I JUST LOVE it, and SO… I WOULD LOVE IT!! I love the stories that define this beautiful bedding. I am fortunate to live in this wonderful town and I would love any of these. Love the Biltmore and the linens too! Love the colors. Just love all of this bedding! I love the name of the ensemble “Enchanting”. It mentions magnolias which bring back enchanting memories for me. When I was a child my grandparents had a large magnolia tree in their back yard and we would have family gatherings under it. And when I say gatherings I mean large numbers of family. They had 10 children, with spouses and children, and whenever possible everyone would try to come home and have dinner and then meander to the back yard for treats and stories. We used it’s shade in the hot Georgia afternoons to cool off and eat watermelon or boiled peanuts. Later on in late summer we ate grapes from my grandfather’s vineyard under it. We shared so many wonderful stories of our family and everyone would get caught up with what was going on. We shared recipes and my grandfather would share his grape jelly that he made. And once in a while we would perform first aid under that tree when a child was stung by a bee or we got a scraped knee from chasing each other. When I purchased the home I live in now the biggest selling point for me was that it has a magnolia tree in the front yard. I can still hear the laughter and feel the love that was shared under a tree very similar to it. I would love to have the bedding to continue that love inside my home as well. Just love Enchanting; however, all choices are reminders of Warm Southern Days! Oh my. Love the Biltmore House and these beautiful beddings! Beautiful. Love the pattern Enchanting. My bedroom needs a facelift and this just might be the answer. I love all the Biltmore bedding! It would look so luxurious in my home! What a stunning collection! I would love to win the Sanctuary set, what a perfect set for the bedroom, light and peaceful with a bit of a nautical flair to it. Love it! Would love to win the bedding, beautiful! We would love to win the bedding. The Biltmore is my favorite place to visit. Your post are always welcome in my mailbox. I love the Enchanting bedding because it is beautiful and serene. It encapsulates everything I have ever loved about Victoria magazine. This would be a lovely refresher for a bedroom makeover! They are gorgeous! Hard to pick just one. What beautiful bed dressings! Anyone would love these. The Biltmore at Home bedding is beautiful and I would love to win. I did post the message on my Facebook page and I’m sure my interior decorating friends will love reading about the collection. I’m keeping my fingers crossed to be the winner. Such beautiful linens! I would love to win a set. But how to pick which one? Bought a new bed so would love new bedding and so gorgeous as well. I love the Biltmore selections. Thank you. Absolutely beautiful….I’d never be able to afford such a collection of bedding….I so hope I win! I would love to win the beautiful bedding. Would be great as I am remodeling.